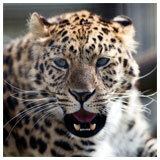 The Amur leopard (Panthera pardus orientalis), also known as the Manchurian leopard and the Far Eastern leopard, is a wild feline predator native to the mountainous areas of the taiga as well as other temperate forests in Korea, North-east China and the Russian Far East. 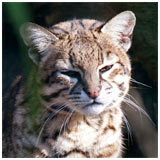 It is one of the rarest felids in the world with an estimated 30 to 35 individuals remaining in the wild. The International Union for the Conservation of Nature has deemed the Amur leopard critically endangered, meaning that it is considered to be facing an extremely high risk of extinction in the wild. Because of its short tail and prominent ear tufts, the caracal is often called the desert lynx but it is not closely related to the lynxes. 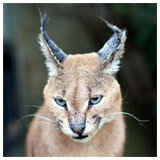 Smaller than a true lynx, the caracal is about the size of a labrador dog. It has a long slender body and long legs. Hind legs are notably longer than the forelegs. Compared to the similarly sized serval, the legs are moderately long and stout. The tail tapers sharply at the tip, and is considerably longer than those of the lynxes. The former monotypic Clouded Leopard has now been divided into two separate species after molecular DNA studied revealed two distinct populations - The Mainland Clouded Leopard (Neofelis nebulosa) and the Sunda Clouded Leopard (Neofelis diardi). The Mainland Clouded Leopard is distributed throughout much of southeast Asia, from northeast India southwards to the Malaysia Peninsular. 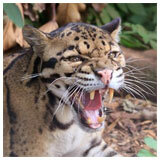 The Sunda Clouded Leopard is found on the island of Borneo and Sumatra. 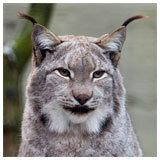 Largest of the lynxes, the Eurasian weighs about 20Kg., with the largest specimens being found in Siberia. This is a long-legged animal with big feet for walking on snow. 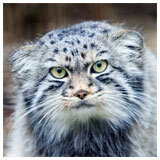 Its fur is greyish and often largely without pattern, although some forms have spots or "tabby" stripes. The tail is very short with a black tip. Named after the French naturalist Geoffroy St. Hilaire, Geoffroy’s cat is a small, lightly built, spotted cat which is highly variable in coloration. The northern animals are a brilliant ochre, while the southern ones are more silvery grey, known as the silver phase (Law and Boyle 1983). 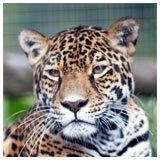 Athena, aka "Jags", is currently our only jaguar. This species takes its name from Peter Simon Pallas, a German naturalist who contributed significantly to the scientific exploration of the Russian Empire. 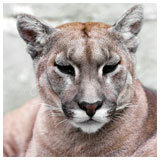 A lithe, slender animal, the puma has strong and very muscular limbs. The neck is comparatively long and the body rather elongate. They have relatively small heads with short faces. The dark ears are rounded, and not tufted. Characteristically the puma’s hind legs are longer than the front. This difference, which elevates the rump, is the greatest in the cats, and is believed to be an adaptation for jumping. A long heavy cylindrical tail is used as a counterbalance. 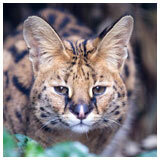 Servals have relatively the largest ears and the longest legs in the cat family. Their feet are actually elongated rather than their legs. With long necks, their heads are small and slim. Their pelage is tawny-gold in colour and marked with round black spots. Ground colours vary from pale yellowish to buffy-red. Generally the spots are large and they tend to merge into longitudinal stripes on the neck and back. Sometimes there are numerous small spots, giving a speckled appearance. 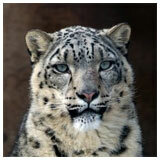 The snow leopard has thick soft fur and a long bushy tail. The tail is used as a counterbalance when jumping, and to wrap around the body when the animal is at rest. Cream or smoky-greyish above, the lower parts of the body are white. In winter the coat often becomes paler. The pelt is marked with dark spots, rings or rosettes. The head is dotted with round black spots. As an adaptation for cold, the ears are small and very furry. They are conspicuously marked, as are the ears of most cats, with a central white spot on the dark backs.